I simply need to synchronize local files in my environment. When I save a file in directory A the changes need to appear in the same file in directory B. There is a server running locally, Im not sure if thats important, in sublimetext I was able to just sync the files witout worrying about the server. I have not found that the documentation addresses this. but have not been able to apply it to my situation. I am not sure why the file in the destination directory of my mapping does not update when I make a change in the source directory. Settings | Deployment | Options -- make sure that you have set it to upload changed files *automatically* on save, otherwise manual upload/sync will be required. There doesnt seem to be any way to mark as default. On the mappings tab there is a button labeled "use this server as default" it is greyed out and not selectable. 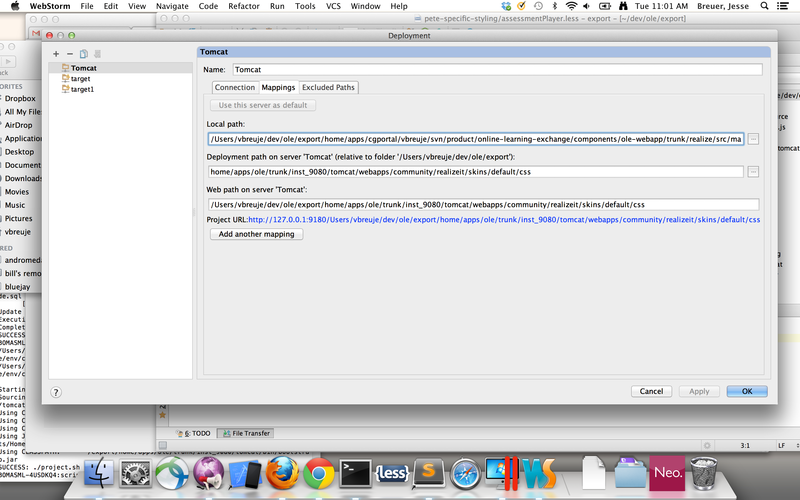 also in the Tools | Deployment menu the whole top section including "upload to" is greyed out. This means (extremely likely) that you have not configured it properly. I have attached screen shots thanks for your help. select "local or mounted folder" and for project files put in /Users/vbreuje/dev/ole/export (a part of the path shared by both the source and the target). 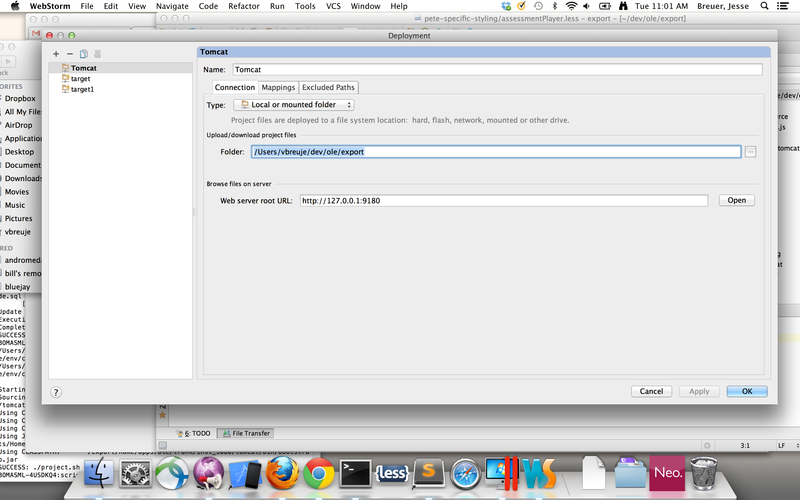 I go to mappings tab "use this server as default" is greyed out. The path you are having is soo long that I'm loosing the idea of what can be wrong there. What is the project root path? Can u just leave deployment path as "/" and move the rest of it to the "connection" tab, so it would be "/Users/vbreuje/dev/ole/export/home/apps/ole/trunk/inst_9080/tomcat/webapps/community/realizeit/skins/default/css"
Is there any chance to use shorter paths (e.g move project into another shorter location)? What log says about it (Help | Show Log in Finder) -- does it has any useful notes? I see "File Transfer" tool window opened -- any useful info there? You can set "Preferences | Deployment | Options --> Operations logging" to "Details" -- it would log each file, not just general stats.